Ariel Kachuro/Pipe Dream Photographer This year’s commencement will start on May 18 and run until May 20. It will feature nine ceremonies and 11 student speakers. 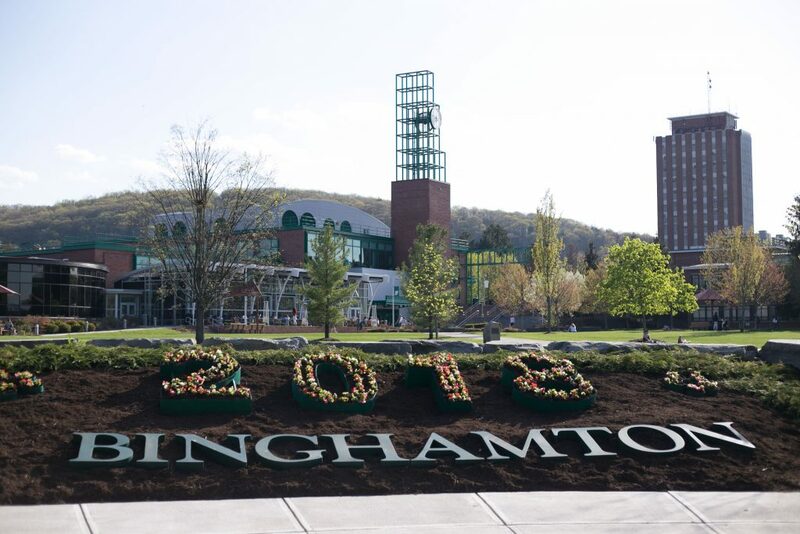 Next weekend, approximately 3,800 Binghamton University students will don green gowns and file into the Events Center, where, surrounded by family and friends, they will celebrate their personal and academic accomplishments at commencement. Along with speeches from alumni and University staff and faculty, 11 students will deliver personalized addresses to their peers. Nine ceremonies, for both undergraduate and graduate students, will take place over the course of three days. The first ceremony, on May 18 at 9:30 a.m., is Tekes Siyum, a Jewish commencement ceremony. The last ceremony will be held on May 20 at 4:30 p.m. for undergraduate students in Harpur College of Arts and Sciences. Throughout the three days, the student speakers will take the stage to address their peers. In order for students to speak at graduation, they must go through a process that is unique to each school. The School of Management (SOM), Harpur College, Thomas J. Watson School of Engineering and Applied Sciences and the College of Community and Public Affairs (CCPA) students go through a similar procedure, where interested students submit applications to their school’s commencement committee. The Decker School of Nursing’s process differs from the rest — rather than selecting speakers through a commencement committee, all graduating students get to choose their commencement speaker, voting on anonymous speech summaries through email. Harpur College’s student speakers include Jack Dillman, a senior double-majoring in cinema and English who is speaking at the first ceremony; Tamar Ashdot-Bari, a senior double-majoring in English and Judaic studies who is speaking at the second ceremony; and Mary Golden, a senior double-majoring in music and English who is speaking at the third ceremony. Billy Manuel, a graduate student studying family psychiatric mental health nursing, will be the graduate student speaker at the Decker ceremony, with Daniella Palomba, a senior majoring in nursing, giving the undergraduate speech. Atdhetare Ame, a senior majoring in mechanical engineering, and Jung Park, a senior double-majoring in computer engineering and business administration, will speak at the the Watson School’s ceremony. Keivyn Reyes, a senior majoring in business administration, will speak at the SOM ceremony, and Risa Scharf, a senior majoring in psychology, will speak during the Tekes Siyum ceremony. At the CCPA ceremony, Laila Davis Clark, a graduate student studying public administration, will be the graduate student speaker and Brittany Hall, a senior majoring in human development, will be the undergraduate speaker. Dillman wrote in an email that he has wanted to speak at graduation since he was a freshman. According to Dillman, he has been consulting the public speaking lab in order to prepare for his speech and reciting it to friends who will listen. Dillman wrote that his speech will focus on the importance of being yourself, believing in yourself and being motivated for the future. Ame wrote in an email that while she does not have public speaking experience, she finds comfort and support through her close connection with her classmates. Ashdot wrote in an email that her experience as a singer and the various presentations she has given throughout her undergraduate years have prepared her well for her speech. According to Ashdot, her unexpected college experience inspired her theme for the speech, which is perseverance. Each ceremony is expected to last approximately two hours. During the ceremonies, faculty, graduating students and their guests can expect to hear words from University President Harvey Stenger, Provost Donald Nieman and the deans of each of their respective schools. The ceremonies will also include the presentation of honorary degrees and alumni awards. This year, honorary degrees will be presented to Aaron Mair, ‘84, the former president of the Sierra Club, who will speak at the graduate ceremony; Ali Carkoglu, ‘94, a professor at Istanbul’s Koç University, who will speak at the CCPA ceremony; and Asuncion “Sunny” Hostin, ‘90, a lawyer and journalist, who will speak at Harpur College’s second ceremony. Tickets for the ceremony are provided free of charge to graduating students, with the number of allocated tickets dependent upon the size of the ceremony. Those still in need of extra tickets can claim any available extra tickets from the Events Center website. Additionally, for those who cannot attend the physical event, all ceremonies will be broadcasted live on BU’s YouTube channel.